Chandi Homam is a sacred fire prayer performed to invoke the blessings of Goddess Chandi – the fierce and powerful form of Goddess Shakti. She is the primeval energy and is responsible for the creation, sustenance, and destruction of this entire universe. She is hailed as the sum total of the energies of all lives in this universe. 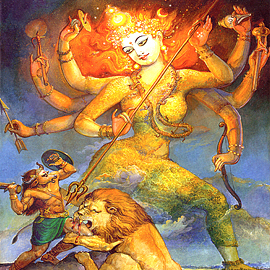 According to the sacred text, Devi Mahatmyam, she is portrayed with eighteen arms, each holding a different weapon to ward off all the negativities and guard her beloved devotees. Goddess Chandi is an embodiment of power and all the divine forces, who safeguards you from evil forces and perfects your mind and body. By worshipping the Universal Mother through this sacred fire prayer, you can get rid of negative forces such as evil eye, curses, and obstacles and be bestowed with lasting health, wealth and prosperity. Who Should Perform Chandi Homam? Navaratri, the nine special nights of the supreme goddess is considered extremely auspicious for performing Chandi Homam. Apart from these days, other days conducive for the Homa include Ashtami (8th Moon phase), Navami (9th Moon phase), Chaturdasi (14th Moon phase), Magha Amavasya (New Moon in the month of Magha), Jyestha Amavasya (New Moon in the month of Jyestha), Chitra and Karthigai Pournami (Full Moon in the months of Chitra and Karthigai). It is preferable to perform the Homa during daytime and preferably finish the rituals before sunset. A Chandi Homa is not an ordinary fire ritual and has to be performed by expert priests with years of experience in handling such a complex and powerful homa. Chandi homa will help one become free from evil eyes, curses, obstacles and also be blessed with long-lasting good health, wealth and prosperity. Goddess Durga, the chief deity of this Homa, will gift you with the power to balance your passion & dispassion and indulgence & denial. You will be able to manifest your true divine self that unites selfishness and selflessness. Devotees who worship Goddess Durga will find themselves overflowing with desires. You will receive sacred Gray ash Powder, Vibhuti and Kum-Kum (Red Vermillion Powder) that was blessed in the rituals. Keep this on your meditation altar and wear on your forehead during meditation or other times and expand the Divine blessings into your life. Please Note: Your Prasad will be shipped from Chennai, Tamil Nadu. Please allow 2-3 weeks for delivery after the whole rituals. A Chandi Homa is not an ordinary Homa and has to be performed by expert priests with years of experience in handling such a complex and powerful homa. If not done properly, the results might not be fruitful. Ganapati Pooja: Prayers are offered to the Lord Ganesha seeking his blessings. Worshipping Lord Ganesha can clear all the obstacles and pave the way for one’s success. So, before any auspicious beginning, Lord Ganesha is first addressed with Pooja and prayers. Kanya Pooja: Kanya Pooja is one of the highlights of the Navaratri celebrations. Kanya Pooja is a ritual of worshiping girls (aged 6 – 10) who have not attained puberty, symbolizing the Kanya Kumari (prepubescent) form of Goddess Chandi or Durga. This ritual is specially performed to recognize the divine feminine power vested in a girl child. Anugna Sankalpam: Seeking the consent of the Goddess to perform the Homa, the sacred fire ritual. The ritual specifies for whom, where and when the Homa is performed. Punyahavachanam: Purifying the mind, body, and place before the Homa is performed. Water is sprinkled with mango leaves around the place with the chanting of Mantras. Kalasa Sthaapana: ‘Kalasa’ means a pot. It is made of metal and is filled with water and placed with Mango leaves immersed in the water. Pooja is made to this Kalasa invoking the blessings of the Goddess. Saptashati Parayanam: Chanting of Durga Saptashati (700 verses) and worshipping the various forms of the Goddess. Bhairava Bhali (offering): After the chanting of Slokas, an offering is made to Lord Bhairava (an incarnation of Lord Shiva) to signify the ritual. Ganapati Pooja: Prayers are offered to Lord Ganesha before beginning the Homa. Punyahavachanam: Pooja and mantras are chanted to purify the place and people who are performing the Homa. Gho Pooja: The Sanskrit word ‘Gho’ means Cow. In Hinduism, a cow is considered a holy animal embodied with divine qualities. Pooja and prayers are offered to the cow before the Homa, seeking her blessings for prosperity. Suhasini Pooja: Worshipping an elderly married woman (whose husband is alive) and performing Pada Pooja (traditional foot-washing ceremony) to receive her blessings. Dampati Pooja: ‘Dampati’ means a couple. Prayers are offered to an elderly couple with Pada Pooja. Brahmachari Pooja: A ‘Brahmachari’ is an unmarried man. He is held in high esteem in Vedas and Puranas for several reasons. Pada Pooja and prayers are offered to a Brahmachari seeking his blessings. Chandi Homa: The fire prayer is performed with the chanting of Mantras and Slokas. Sumangala Dravyaahuti: Auspicious materials such as saree, turmeric, sandalwood powder, kum- kum (red vermillion powder), etc. are offered to the Goddess invoked in the sacred fire. Purnaahuti: Any Homa becomes complete only when this ritual is performed. Betel leaves, betel nuts, coconut, kum-kum (red vermillion powder), turmeric, flowers, fruits, a coin, and a small bag of herbs are put together in a silk cloth and tied. The bag is dropped into the fire seeking the blessings of the Almighty. Maha Deeparadhana: A ritual to honor the Goddess. Lights are lit using camphor and are used to glorify the Goddess. It is also called Aarti and is performed during the end of the Pooja. This divine intervention can be accessed by offering your fervent prayers to the remover of obstacles – Goddess Durga. Also called Chandi, she is the only solution to your question of “How to solve problems in life.” The knowledge of this fundamental truth has helped innumerable devotees to manifest their desires instantaneously. Gain the blessing of the supreme primordial Goddess with the divine technique of Chandi Homa.